Please join us for a concert on the Chicken Coop Stage at Feather River Hot Springs. 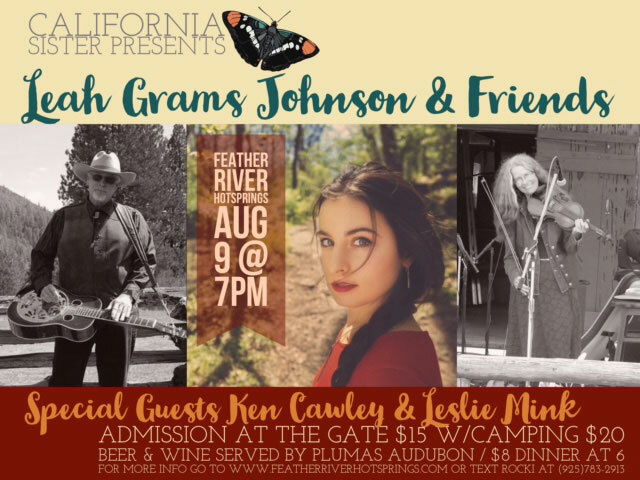 Concert at 7 pm / $8 dinner at 6 pm / Beer & wine served by Plumas Audubon. Leah has been performing since 2008 and continues to satisfy and amaze audiences with her natural grace, charisma, and poignant storytelling. She is an alumna of Berklee College of Music’s songwriting program, and now resides in Nashville, TN to further hone her craft. Respected by artists and critics, and loved by audiences, Leah is developing what is sure to be a long and memorable career with her enrapturing voice and undeniable songs.